Most in-stock products for orders placed before noon EST are shipped same day, however it depends on the the amount of orders we are processing that day. Handmade and custom items generally ship within 2 weeks, longer if it surrounds a holiday. If you have an urgent gift deadline, please contact us info@inspiredendurance.com. Are your products Sterling Silver? Yes. All of our products are .925 sterling silver unless noted otherwise. Vermiel is .925 sterling silver micron coated in 14kt gold. Are your gold products solid or plated? All of our 14kt gold pieces are solid 14kt gold. All sterling silver is prone to tarnish. With proper care, you can keep it looking brand new. When worn daily, we suggest cleaning weekly with a silver polish cloth. Also you should avoid heavily chlorinated pools and spas or contact with any other harsh chemical. Do your beads fit Pandora®? Yes, all of our beads are compatible with Pandora® products. Our beads are also compatible with most major bead lines such as Troll and Chamilia. Yes, however with the exception of Canada, we only ship Express Mail International due to a high amount of missing or delayed packages. I need a gift for this week. Will I get it in time? Please contact us at info@inspiredendurance.com to let us know your delivery deadline. If it is in stock we can get your order to you in time! Express Shipping is available to every state in the United States and is guaranteed 1 or 2 day. Will engraving and gift wrap delay my order? No. All of our engraving is done by hand. What does your engraving look like? 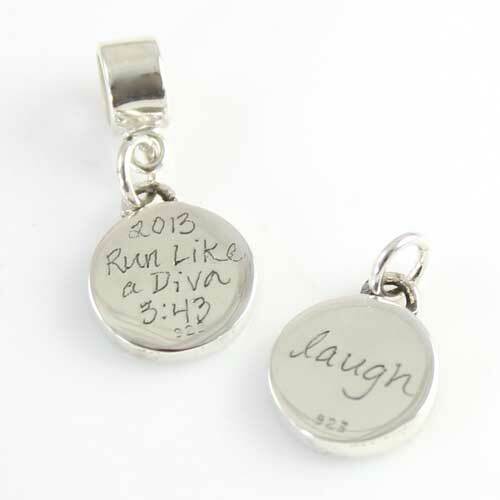 How much engraving will fit on the back of your charms? We can get a lot on a charm, typically a city name, race date, and finish time on three lines fits perfectly. I purchased a charm bracelet last year. How do I add the charms? All of our charms come with a sterling silver “jump ring” which we suggest taking to a jeweler to add. You may also consider adding a “lobster claw for charm bracelet” or look up “how to use a jump ring“ on YouTube. My necklace broke. How do I get a replacement? All products are backed by our 100% Satisfaction Guarantee. Simply email us at info@inspiredendurance.com stating the type of product, size, and your mailing address. All priority and express orders are trackable at www.usps.com or from the shipping confirmation email you received when your order shipped.